Diwali is a religious festival of Hindus celebrated with great joy by lightning lamps, candles and diyas. We are writing some easy language essays on Diwali. Your kid can use these essays in their school essay competition and learn the significance of this festival. India is a land of Festivals. Every festival is celebrated with great pomp and fun. Different festival has different religious or mythological significance behind it. Diwali is a festival of lights. It is celebrated continuously for five days. It falls in the month of October or November. Diwali is specially celebrated by Hindus. It marks the victory of truth over evil and victory of Lord Rama over Ravana. It is celebrated for welcoming Lord Rama to Ayodhya after Fourteen Years of exile. People in Ayodhya lighten up the whole Ayodhya with candles and lamps. Sweets and gifts are distributed among friends and relatives. At night Crackers are burst all around and later Laxmi pooja is performed with all rituals. Shop-keepers perform pooja in their shops as well as at home. Shops and houses are lightened with colourful lights. The evening is the most interesting part of the festival Children burst crackers. The sound of bursting bombs heard all around the city. Everyone looks happy enjoying the festival. People worship the goddess of wealth goddess Lakshmi. They wish for good health and wealth. Diwali is considered as the most favourite festival all around the country. It gives a message of love, brotherhood and friendship. The heart of every one is lighten up with lights. 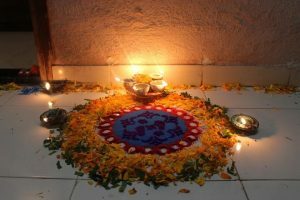 Diwali is one the most important festival in India. It is a festival of light celebrated with great enthusiasm. It falls on the Amavasya Kartika month every year according to Hindu calendar. Many stories are associated with this festival. It marks the victory of Lord Rama over Demon Ravana. Diwali is the symbol of the victory of truth over lie. Great preparations are done on this festival. Everyone starts doing preparation one month before Diwali, buy new cloths, clean houses and renovate theirs shops and homes and decorate with lights, flowers and colourful decorative items. On this festival, sweets and gifts are distributed among friends and relatives few days before. People indulge in fun and frolic on this festival. Wear new clothes and during night they do fire-works and burn crackers. The festival wears a lovely look. Some celebrate this festival in most enthusiastic way where as some indulge in gambling. At night the people illuminate their houses and terraces with earthen pots. The Hindus worship Goddess Lakshmi on this day. They perform puja, so that Goddess Lakshmi may visit their houses as goddess Lakshmi is the goddess for wealth. Girls make rangoli at the entry of the main door to welcome goddess Lakshmi. Lakshmi Puja is the Puja performed at the night with money during Diwali. This festival also creates a sense of oneness among peoples. It becomes the symbol of unity. India has celebrated this festival for many years with great joy and will continue celebrating with all rituals. Diwali is the most important Hindu festival celebrated all over India. This festival falls in the autumn season in the month of October or November every year according to Hindu calendar. The spiritual significance of this festival indicates the victory of truth over evil. It is a five days long festival celebrated by the people with great preparations and rituals. Before 7-8 days of this festival, people start cleaning and decorating their homes, shops and offices. They shop new clothes, decorative items like diyas, lamps, candles, puja materials, statue of God and Goddess and sweets for Diwali. On this festival People worshiped God Ganesha and Goddess Lakshmi for getting wealth and prosperity in their life. They perform Lakshmi (money) pujan with great rituals. After puja, everyone burns crackle and distribute sweets and gifts to neighbours, relatives, friends. People celebrate Dhanteras on first day, Naraka Chaturdashi on second day, Diwali on third day, Govardhan puja on fourth day, and Bhai Dooj on fifth day of the festival. These five days are announced as gusted holiday in India. Diwali is Indians favourite festival and it is celebrated with lots of enthusiasm with family and friends. Diwali is known as the festival of lights as it is celebrated by lighting lots of diyas and candles. It is a traditional and cultural festival celebrated by every Hindu all around India and in other countries too. People light up their homes with lots of candles and small clay oil lamps indicating the victory of truth over evil. Friend and neighbours gathered in the evening and enjoy with lots of delicious Indian dishes, burning crackles , dancing, all through the night. People make rangolis at the entry of house to welcome goddess Lakshmi. Children generally enjoy the festival by feasting, bursting crackers and enjoying the dance with family and friends. However, it is prohibited to burn crackers as it spread pollution in the air and water. And the health of people suffering from lung or heart diseases and hypertension get affected. Diwali festival is celebrated by the people with great fun and frolic activities. It is the festival of great significance for Indian people. There are many ancient stories, and myths about celebrating this great festival. The spiritual significance of this festival symbolizes the victory of truth over evil and light over darkness. It is celebrated to honour the Goddess of wealth Lakshmi and God of wisdom Ganesha. According to Hindus it is celebrated on the return of Lord Rama, Sita and Lakshmana to their home Ayodhya after long period of 14 years. And the people of ayodhya welcome them with great joy and there was full lightening all around because everyone there was happy on the return of Rama, Sita and Lakshmana. Diwali celebration also indicates the start of a Hindu new year in the western and some northern parts of India. It is celebrated by the people of Sikh religion as they celebrate the Bandi Chhor Divas by lighting up the Golden Temple. It is celebrated by Jain religion to mark the Nirvana festival.